We’re kind of obsessed with sensory play in our house! So, when some other blogging colleagues wanted to get collaborate and put together a huge sensory bin filler resource I was ecstatic! Forty bloggers are sharing 40 different fillers over the next 40 days and you can find them all HERE! While doughs and slimes are fun to play with, these bins all feature materials that are “drop and go” so they’re really easy to put together when you need a simple activity! Today’s bin in the series features tapioca pearls! 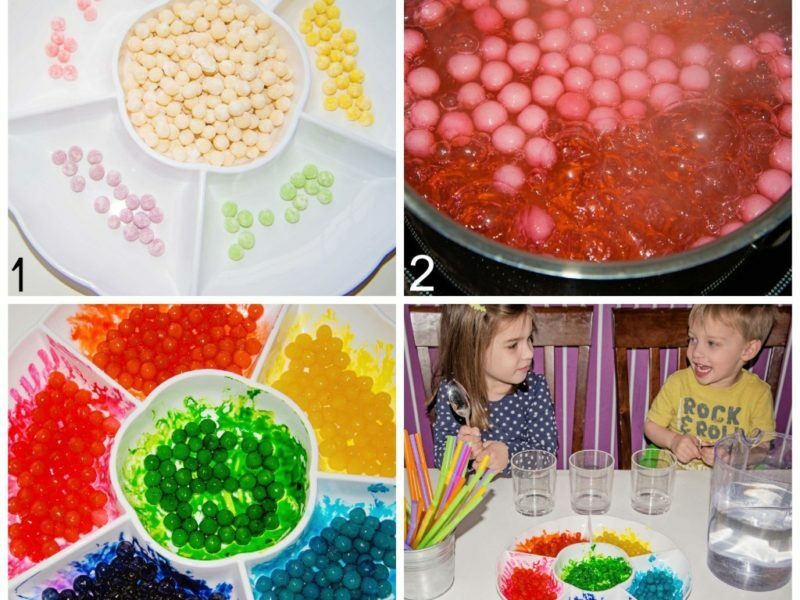 They’re similar to water beads, but are completely edible! Tapioca pearls, or boba as they are sometimes called are a Taiwanese ingredient in bubble tea. The balls begin small and puff up after you cook them. They are usually black, but they also can come colored, which I got. I sorted them in to six piles to dye all the colors of the rainbow! 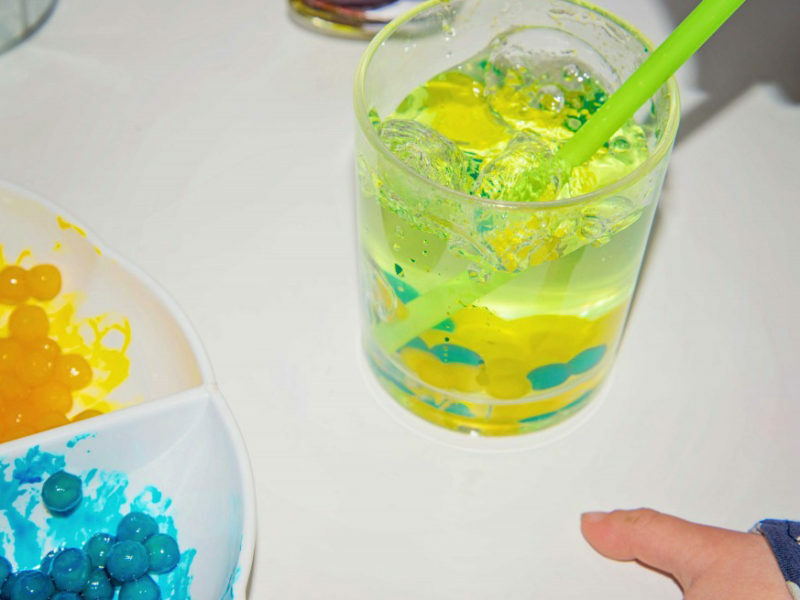 Boil the boba for five minutes in colored water for a pastel pearl. If you want a more saturated hue, roll the pearl in a bit of gel food coloring after it finishes cooking. Let it sit for 10 minutes to cool down and absorb the color, then rinse the boba off so that the kids don’t get too much dye all over their hands! I set up a pretend bubble tea station for the kids to play with. Straws, water, cups and spoons are plenty to get the imagination flowing! This simple set up offers lots of educational opportunities. 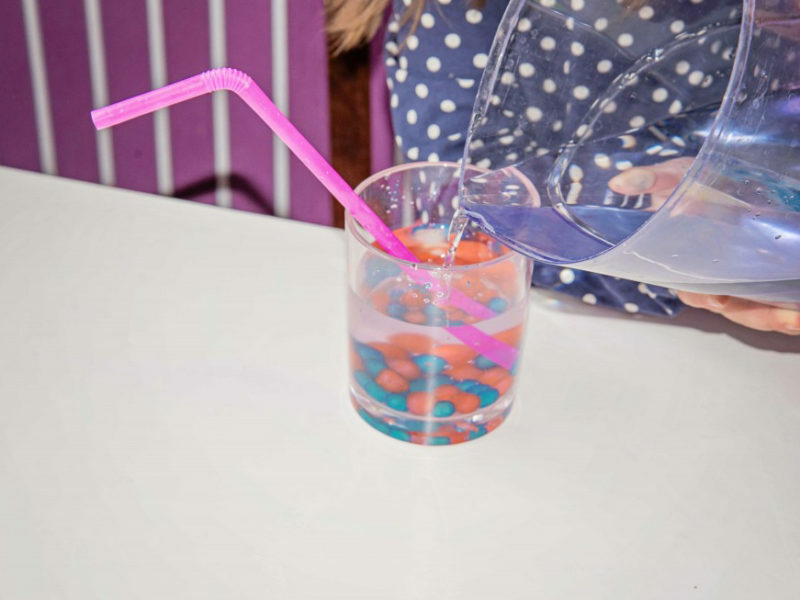 Kids can have fun exploring a new sensory material, practice transferring the boba on a spoon, and pouring water from a pitcher to a cup. We also worked on color theory by combining the right primary colors to make each of the secondary ones! Any time straws are present, bubbles must be blown! We each tasted the tapioca pearls, they really don’t have much flavor. This is one food I prefer to play with instead of eating!